Elephant Revival is five musicians with an unusual indie-bluegrass sound. Boulder County-based band Elephant Revival (ER), scheduled to play at FAIRfest in Fairfield June 19-21, embraces the motto “where words fail, music speaks.” Formed in 2006, Elephant Revival seeks to inspire the human spirit through song and dance collaborations with musical tapestries influenced by Celtic, Americana, folk, and jazz styles. Delightfully, they have close friendships with Portland-based Shook Twins (reviewed in March 2015), who will also participate in this year’s FAIRfest. 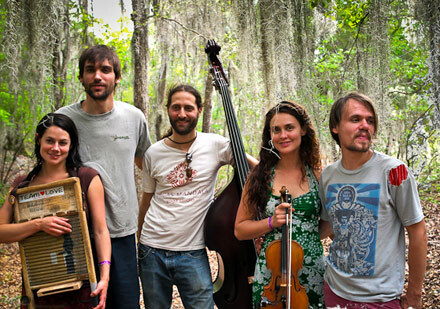 The five multi-instrumentalists and vocalists from ER come from various places around the U.S. Dango Rose (double bass, mandolin, and banjo) started singing from an empty elephant enclosure at a Chicago zoo. The band’s name honors the zoo’s two pachyderms that died on the same day after being separated. Bonnie Paine (washboard, djembe, and electric saw) grew up in Oklahoma. Rounding out the group are Bridget Law (violin), Charlie Cook (banjo, pedal steel guitar, horns, double bass, and cello), and Daniel Rodriguez (acoustic guitar, electric banjo, and guitar). Each contributes to the progressive instrumental edge and vocal harmonies that create moody, hopeful, and upbeat stories. From time to time, the band cuts loose with upbeat Irish reels that give Bridget Law an opportunity to demonstrate her mastery of the fiddle. Whether it is foot-stomping time or serene ballads, ER delivers! If time’s a river, we’ll reach the sea. If waking life’s a dream, then wake me up. Wake me up with serenades. An endless dance, and endless face. And I won’t mind the change. Since their first album in 2008, ER has released three other CDs. To prepare for their performance at FAIRfest, check out my favorite two songs from each album. On the third weekend in June 2015, let’s look for opportunities to sway and hang trunks with Elephant Revival and Shook Twins near the Main Stage at the Sondheim Center. The two bands seemed destined to lay down the perfect ambience for this event.